Buffett also sat down for a short interview where he discussed the upcoming musical, the tour, and that his infrequently recurring character pilot Frank Bama on Hawaii Five-0 may go out in a blaze of glory in the upcoming final season of the television show. Jimmy keeps on chugging with the I Don’t Know Tour on Tuesday in Orange Beach, AL, followed by shows in June in Atlanta, Houston, Detroit, Cincinnati, Indianapolis, and Chicago. There’s still plenty of time to get your tickets! 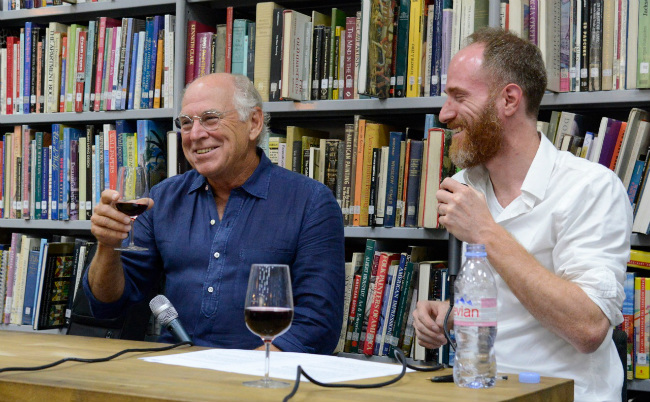 When Jimmy Buffett was in Paris a couple months back, he stopped by The American Library for a talk and to play a couple songs (“Rue de la Guitare” and “He Went to Paris”). The American Library has uploaded the full interview with Buffett (1 hour long). It’s a great long-form, open discussion with Jimmy. Among other topics, he talks about the early French influence on the Gulf Coast and in New Orleans and how it led to his love of Paris.